Jeff Thomas is an Iroquois photographer, curator and writer. In his photographic practice, Thomas challenges the stereotypes and cultural erasure of Indigenous peoples in documentary media by rectifying historical narratives that relegate Indigeneity to a reductive and romanticized past. Thomas is particularly interested in addressing historical biases that cast Indigenous identity as one caught between tradition and modernity. The conceptual thrust of his practice is informed by his identity as a self-described urban-Iroquois. This term denotes Thomas’ hybridized identity, which balances the nuanced complexities of being Indigenous in cosmopolitan cities. During his childhood in New York State, Jeff Thomas lived on a Six Nations reserve and subsequently relocated with his family to the city of Buffalo. Influenced by an upbringing between the reserve and city, his works probe the legacy of colonization and the fragmentation of Indigenous histories in urban centres across the United States and Canada. 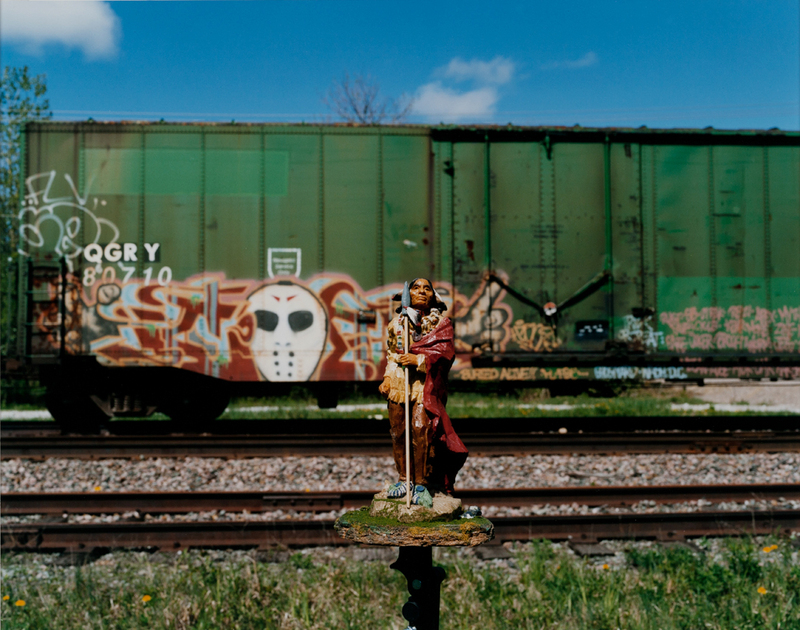 The Delegate, trackside, Gatineau, Quebec is a photograph of a toy figurine—a Eurocentric stereotype of an Indigenous leader donning a headdress—that foregrounds a stationed, graffitied boxcar. In this work, Thomas critiques the history of nation-building, colonialization and industrialization, which led to the land expropriation of Indigenous peoples. The Delegate, trackside, Gatineau, Quebec comments on the absence of Indigenous consultation in the development of the Intercolonial Railway and narrates the forced displacement of Indigenous nations. As a symbol of modernity and economic prosperity, the construction of the Intercontinental Railway is inextricably linked to Canadian nationhood. Thomas’ use of the term “delegate” alludes to the Charlotte Conference of 1864, where delegates from Nova Scotia, New Brunswick and Prince Edward Island discussed joining their three provinces. Drawing support from the Province of Canada, this meeting set in motion the founding of the Confederation. The joining of the Maritime colonies was conditional on the construction of an intercolonial railway. Thomas recontextualizes this history as a biased, faulty and one-sided narrative that marginalizes dissenting voices. The Delegate, trackside, Gatineau, Quebec expands our cultural reading of railways as more than routes of convenience used for industries of commerce, tourism, and military. Railways served a national agenda to colonize vast expanses of land that forcibly uprooted Indigenous communities, who continue to be displaced to this day. Jeff Thomas is a Buffalo-born and Ottawa-based self-taught artist. He has exhibited his work at the Albright-Knox Art Gallery, Buffalo; the Swiss Institute, New York City; the Art Gallery of Ontario, Toronto; and the McMichael Canadian Art Collection, Kleinberg. His work is held in the permanent collections of the National Museum of the American Indian, Washington, DC; the British Museum, London, UK; the National Gallery of Canada, Ottawa; and the Canadian Museum of History, Gatineau. He is a member of the Royal Canadian Academy of Art. He has received numerous awards, including the Duke and Duchess of York Award in Photography, the Karsh Award in photography and the REVEAL Indigenous Art Award. This art of the month is dedicated to Jeff Thomas’ receipt of the Governor General’s Award in Visual Arts and Media in 2019.